MySQL 5.5 or later is recommended, or MariaDB installed on your Linux virtual server. PHP 5.4 or higher with the following PHP extensions enabled: mcrypt, cURL, GD, GZIP and PDO. After the installation is complete, Nginx will automatically start. Edit the ‘/etc/php/7.0/fpm/php.ini’ PHP configuration file. Do not forget to replace ‘Str0ngPa55w0rd’ with an actual strong password. Database password: enter the MariaDB password for the PrestaShop MariaDB user. Once you deleted the installation directory, login to the PrestaShop back-end by clicking on the ‘Manage your store’ button. Congratulations! PrestaShop has been successfully installed on your server. 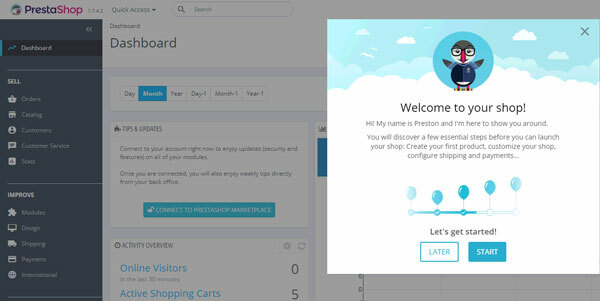 You can now start using PrestaShop and customize it according to your needs. Of course, you don’t have to Install PrestaShop on a Debian 9 VPS if you use our Managed PrestaShop Hosting services, in which case you can simply ask our expert Linux admins to install PrestaShop on Debian 9, for you. They are available 24×7 and will take care of your request immediately. PS. If you liked this post, on how to Install PrestaShop on Debian 9, please share it with your friends on the social networks using the buttons on the left or simply leave a reply below. Thanks. nice tutorial but i don’t get what do you mean with: your-domain.com/. Do i have to write here my ip address from my server? If you have a domain name you need to change “your_domain.com” with your domain name.